Everything is S’MORE fun with you! I wish I had noticed that this picture was blurry, but I was in a rush! I always seem to wait until the last minute to make cards. OOPS! For this card, I decided to use a few of the products that we sell in the store. The paper is the new “Adventure” collection from Authentique (which still needs to be posted for sale). I just love that tent! The sentiment and the cute little s’more is from Lawn Fawn’s “Love you S’more” set (Click the photo to purchase in my E-Bay store for the discounted rate of $13.50!). It has so many adorable stamps. I was using a demo set, so I just used the ones that came in that set. This was a quick and easy card to put together and it still let my Dad feel special for Father’s Day. I thought it pertained well to him since he used to take us camping a lot when we were little. Thanks for stopping by! Hi everyone! I just made this card so fast! Probably the fastest I’ve ever made a card. It’s such a quick way to let someone know how much they mean to you and it takes barely any effort, but it’s still handmade. All you need is two stencils and some of the alpha stamps from the Michaels dollar bin! The two stencils I used are a new Intoxicating Arts release that I just put up for sale today. These durable clear laser cut mylar stencils are also super affordable! 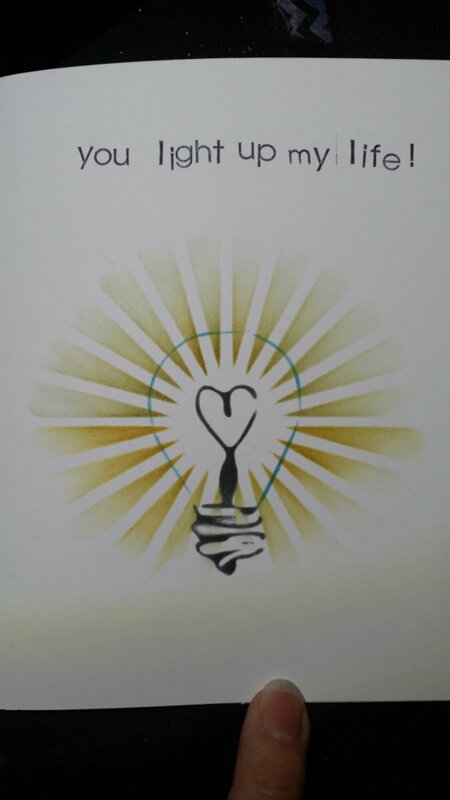 The love light bulb stencil is only $0.89 and “Tunnel vision”, which I used to show light, is only $1.29! These prices make it easy to buy trendy stencils without feeling guilty :-). Available for sale now under the stencil section at shop.intoxicatingarts.com . Check it out! Luster Mica Spray Mists Are Almost Here!! UPDATE : They are available for sale now in a 6 pack for $24.95! Just Click here. We are in the final stages of having these ready for sale, so let me tell you a little more about them. Our spray mists come in a fine mist spray bottle with a mixing ball. All you need to do is swirl it around a few times before spraying and the mixing ball does all the work for you. If you have used other spray mists before, you know that the mica can get stuck and it takes some rigorous shaking to get it loose. That is why I knew our sprays needed a mixing ball. It makes it so easy to mix! I have been spraying these bottles and testing them for months now and I have not had any clogging issues. Clogging is another common problem with these spray mists. I use finely milled mica powders along with a fine-mist sprayer that was chosen after testing others that had failed. I wanted to ensure there would be no clogging. Each label has been sprayed with the same Luster color that’s in your bottle. This makes it easy to know exactly what the color will look like on white paper by having a visual swatch right in front of you. Many times the color in the bottle or on a printed label is not what it actually looks like on white paper. We have taken the extra effort to provide you with a real swatch on the bottle. Many of the Luster colors are two-toned and will look very different on black or dark papers. For instance, Hawaiian Orchid looks very pink on white but it looks more purple on black. Each bottle is packed full of beautiful and lustrous shimmer. Spray on cardstock, canvas, wood, and any other porous surface! Luster sprays are perfect for use with stencils too. We only use FD&C (Food, Drug, and Cosmetic) and D&C (Drug and Cosmetic) safe ingredients. By purchasing Luster Mica Spray Mists you are also supporting manufacturing in the United States! Our sprays are hand-made in small batches which ensures great quality control. All bottles come with a heat shrink seal to prevent spills and shipment. It’s also just so satisfactory to pull of that seal off a brand new item, isn’t it?! As if all of the above wasn’t great enough, these spray mists are super affordable! The 2 ounce bottle is $4.89 and the 4 ounce bottle is a real bargain at only $7.69! There will be discounts for buying the whole set too. If you have any questions about our spray mists that have not been answered in this blog post, please feel free to send me an e-mail at intoxicatingarts@gmail.com and I will be happy to answer your questions!